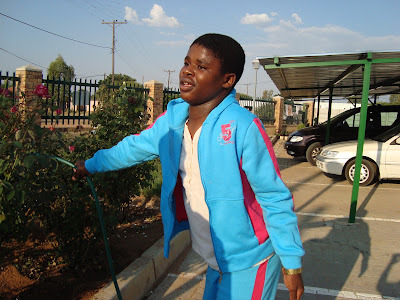 Herman Thapelo, his true identity has been changed for this story, is a 17 year old boy from one of the remote villages of Kweneng District, in Botswana. He is the second child among four boys. His father deserted his mother and the children when Thapelo was very small. He was born with mild mental disabilities and at a very young age he became a victim of epileptic attacks. Because of his handicaps he never went to school. Thapelo’s mother died when he was seven years old leaving him and his brothers orphans. An aunt, who became his guardian and caregiver, was an alcoholic and never gave him the care that he needed, though she received all the benefits for orphans from the Social and Community Development Department in his name. He was left without food for days and without medication for months. He roamed with goats and cows in the fields. In 2010, one day when he was out in the field he had an epileptic attack and was left alone all night. When people from the village found him the next day, he was crippled and could not talk. The attack had severely damaged his brain. With no medical care his mobility was limited to crawling. Without medication his epileptic attacks became more frequent which worsened his condition. At the request of the Village Health Clinic staff and the social workers from the Social and Community Development Department, Pabalelong Hospice decided to admit Thapelo for respite care. The staff of Pabalelong found him living in inhuman conditions in a dilapidated traditional hut. The hospice management and staff welcomed him with open arms and gave him lots of love, care and affirmation. With medication, nutritious meals and physiotherapy his condition gradually improved. He began to stand on his feet, take a few steps with the help of a walking frame and then started to walk independently. It was a slow and gradual process. It took three months for Thapelo to become independent. Today he is able to take care of his personal needs. He is able to interact quite well with others and express himself, though some of his conversations are disconnected. Thapelo enjoys talking to his peer group and going to church. Thapelo has been promised admission at Moswei Rehabilitation Centre at Mochudi for skill training in Horticulture. He is waiting for the school to open in May. Thapelo is lucky to have had the opportunity to receive personalized care at Pabalelong. SCNs at Pabalelong are grateful to the staff and the visiting doctors who loved and cared for him. There are many “Thapelos” out there who need our loving care, let us commit ourselves to love and care for the less privileged.